The on-demand age started more than a decade back and cloud from a conversation point has come of age. Today enterprise IT organizations are looking at a completely new model of IT as the old-school conventional on-premise way of managing the IT infrastructure no longer holds good for the new age digital demands. “Public cloud for India Market is estimated to be around USD 2.5 bn in 2018 and will grow to an estimated USD 6.2 bn by 2022, i.e. 28% CAGR. IaaS becoming foundational with an increased focus on enabling digital solutions and hence the contribution by IaaS would be greater comparatively”, says Santanu Patro, Research Director at Gartner. In 2018, Gartner estimates the fastest-growing segment of the public cloud market will be infrastructure as a service (IaaS). IaaS in India is forecast to total US$1 billion, an increase of 46 percent from 2017. This growth is being driven by organizations refraining from pursuing data center build-outs and consolidation among data center vendors. Software as a service (SaaS) remains the largest segment of the public cloud market in India, with revenue expected to reach $932 million in 2018, an increase of 34 percent year over year. Gartner says that organizations continue the move toward applications and workloads to the cloud locally, as opposed to running them on-premises. Today, SaaS users are increasingly demanding more purpose-built offerings engineered to deliver specific business outcomes. Within the platform as a service (PaaS) category, database PaaS (dbPaaS) is set to be the fastest-growing segment over the next four years. The dbPaas segment is on pace to total $32 million in 2018, an increase of 50 percent from 2017. Gartner expects the segment to reach almost US$113 million by 2022. This presents a great opportunity for hyperscale cloud providers to include dbPaaS in their service offerings to grow their user numbers. The rapid growth of dbPaaS is indicative of organizations in India moving away from traditional on-premises, license-based database consumption models to cloud-based “as a service” models, which are generally more price-competitive. According to company sources, since the launch of the AWS Asia Pacific (Mumbai) Region in June 2016, AWS has seen accelerated customer momentum, with AWS Cloud being used by customers for a broad range of mission-critical business applications. The company’s single biggest differentiator is customer-centric approach. Moreover, AWS has pioneered the startup segment and has established considerable market share and built significant momentum in this space. In fact, a recent report confirmed that over 90 of the top 100 start-ups in India run on AWS. This includes companies like Haptik, Zeta, Gupshup, etc. The company is equally focused on the enterprise space where customers are realizing the business benefits and flexibility that the cloud brings, and then move fast to build a 12-to-24-month migration plan. “In this space, we’re working with a lot of customers who are migrating mission-critical apps and workloads; retiring legacy debt; accelerating their pace of innovation and speed to market, and better leveraging their data through analytics,” according to company sources. This year, IBM has announced multiple new innovations on IBM Cloud that will help enterprises further derive value from their cloud. The company launched IBM Cloud Private (ICP) as an offering to help organizations looking at a multi-cloud strategy. It provides a secure, enterprise-grade, compliance-ready and open platform with PaaS and developer services behind their firewall. Additionally, with the new Cloud Private for Data, an integrated data science, data engineering and app building platform companies can exploit event-driven applications capable of analyzing the torrents of data from things like IoT sensors, online commerce, mobile devices, and more. IBM also has Cloud Object Storage’ (COS) solution addresses the weaknesses of traditional storage options available today by offering a solution that helps enterprises manage data storage requirements while ensuring that productivity and cost considerations are optimally balanced. The solution gives enterprises an option to choose a hybrid cloud model, with both on-premise and public cloud. To cater to the growing demand for cloud, IBM has been working towards building future-ready platforms for the new age businesses. It focuses around the core segments: from being enterprise strong, to help build organizations get value from their data and provide cloud system that encompasses a full range of cognitive abilities ranging from AI to machine learning and coupled with strong security, industry capabilities, and compliance capability. The company says that Oracle is the fastest growing major cloud company in the world because it says that it is the only company delivering a complete portfolio across all three layers of the cloud: SaaS, PaaS, and IaaS. Oracle believes that cloud will be its main growth engine to propel it to succeed and accelerate success for its customers. It is also transforming some part of its sales design with the launch of the Oracle Digital Sales team. These teams will focus on delivering a unique customer experience to all new customers. “It’s targeted at the SME sector. We want to democratize access to the Oracle Cloud and want to help ensure the most simple, personalized and effective sales experience for our customers and future customers,” says a company source. Sources in Microsoft say that the foundation of cloud computing — Infrastructure As A service (IaaS) — has several big players in the enterprise market. 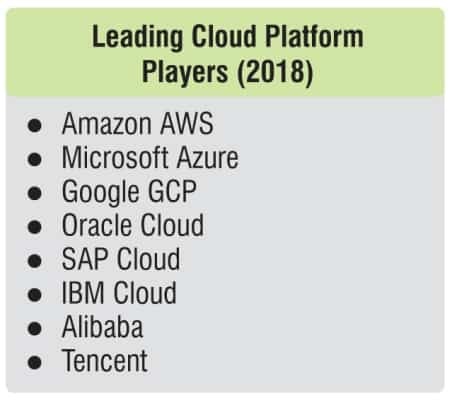 While a few established tech providers are competing for the IaaS market share, 70 of the BSE top 100 companies are on Microsoft Cloud; top 20 public and private sector banks, top 14 core sector companies (oil & gas, power, infrastructure), the top 7 automotive companies and top 5 pharma companies – all are using the Microsoft Cloud, according to company sources. Microsoft has succeeded in carving a niche for itself by always ensuring its product availability to the users in the traditional license model. Microsoft cloud platform, Azure is a paradigm shift for it’s offering in this space, providing Software (SaaS) and Infrastructure As A Service (IaaS) and also a platform to develop new applications on a pay-per-use model. The company says that its strategic decision of launching three data centers here in India have brought the entire power of its technological abilities in developing services on Azure for Indian enterprises, SMBs and governments to help accelerate India’s digital transformation story. Having been a partner-focused and driven organization, Microsoft works with its partner ecosystem with over 9000 partners across 250 cities to help its customers to enable themselves to sell and innovate new businesses in its Cloud. “Our differentiation is measured in terms of the trust that our customers show in us because we bring to them a complete paradigm shift in how they do their business – in which Microsoft has always been a pioneer. Microsoft Azure has helped businesses empower different industries, including financial services, manufacturing, public sector, health, travel & hospitality, insurance, retail, etc. to achieve their goals”, say company sources. SAP has the broadest portfolio of business applications in the industry today with a variety of deployment options – private cloud, public cloud, on-premise – to meet the needs of each customer. Its cloud solutions span digital transformation of a company across a wide range of stakeholders such as Employees (SAP SuccessFactors), Suppliers, partners, and business network (SAP Ariba. Concur) and most critical area of digital transformation across front office through SAP Hybris. Its cloud business continued to grow rapidly with our revenue accelerates to be up 18% (IFRS) and up 31% (Non-IFRS at Constant Currencies), and exceeded €1 Billion for the first time in a quarter during our Q12018 results. “Our strategy is to dramatically simplify IT and business by delivering best-in-class business applications on a single, real-time platform – SAP HANA. And, regardless of deployment model, SAP Cloud Platform serves as an extension platform and agility layer making it possible to build specific capabilities to extend the scope of all of SAP’s applications,” say company sources. And, with the evolution of SAP Cloud Platform from a standard platform-as-a-service solution to an innovation hub, the focus has shifted to meet the needs of companies looking to leverage innovative technologies such as IoT, machine learning, artificial intelligence and big data on a cloud platform. To cater these growing industry needs, it launched SAP Leonardo, a new Digital Innovation System, bringing together Machine Learning, IoT, Blockchain, Analytics and Big Data on SAP Cloud Platform using Design Thinking Services. This is poised to be one of the foundations of technology evolution towards the future. Going by the market projections and the rate of cloud adoption in India, by end of fiscal FY 19, India cloud market will exceed the $ 4 bn mark. Sify’s “Cloud at the Core” Proposition is all about enabling digital transformation. Right from how the solutions are built to how they are delivered, managed and further enhanced, Sify is committed to making the customer’s transition to Cloud at the Core the most rewarding journey for their business, with solutions across Infrastructure, Platforms, and Applications. Sify’s play across the complete gamut gives it a unique advantage and equips enterprises with the power to disrupt, transform, and optimize, thereby, increasing ROI and driving business innovation. 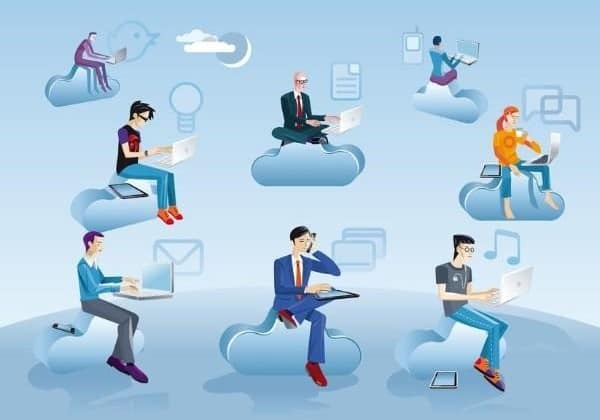 “Cloud at the Core is not only a technological advancement today; it’s a cultural shift towards business transformation,” say company sources. Sify offers Cloud at the Core that is built over two decades of experience enabling the digital transformation of enterprises across industries. Sify’s Hybrid IT solutions are paving the way for emerging technologies like Big Data Analytics, RPA, Blockchain, AI, IoT, AR to foster business innovation with the building blocks of Network, Security, and Cloud. Over 7000 businesses across industries have been leveraging these solutions to deliver superior customer experiences and enhance productivity. Sify is trailblazing into the future of business transformation with its innovative outcome-based, usage-based, and component-based engagement models. The cloud solutions Sify offers are application aware and backed by network experience. And these are not only on the traditional technologies but also software-enabled technologies to deliver business agility. Its Cloud at the Core offerings are spread across Gartner’s Cloud spectrum – Cloud Enabling, Cloud Inspired, Cloud Pure and Cloud-Enhanced, each bringing in unique business advantages. Sify’s offering spans SaaS (hosting and managing the software application and its underlying infrastructure and maintenance), PaaS (creating web applications without the customer having to buy and maintain the underlying software and infrastructure) and IaaS (delivering cloud computing infrastructure including servers, storage, network, and operating systems as an on-demand service). The company says that Netmagic has its unique identity, position play and specialization in Hybrid IT – the management of complex IT environments including multi-cloud scenarios by a single solution provider. The Company is the only end-to-end infrastructure Solution Provider who can act, as a one-stop shop for needs pertaining to multiple clouds. Netmagic’s Multi-Cloud infrastructure allows customers to run their business as they wish – they can run all their workloads on a variety of clouds including our public cloud (SimpliCloud), third-party public clouds, hosted private clouds, and colocation servers while managing them through a single pane of glass – NTT-Netmagic’s Cloud Management Platform (CMP). Our Cloud service portfolio contributes to 44% of the company’s revenue. Netmagic’s USP is its ability to offer customers what they want in terms of end-to-end managed services. Another enabler for us is the fact that we have a physical presence and that we are datacenter partners to most of the cloud service providers. We enable customers in the management of different cloud applications through a single online dashboard and aid the customers in selecting the least expensive cloud or the best performance cloud. We are also placing emphasis on security services. Netmagic’s Disaster Recovery (DR), as a service, helps in aligning an organization’s infrastructure with their recovery time and recovery point objectives. Netmagic’s cloud package has tools such as data analytics and enterprise mobility, which can be used to take a business to the next level. The company says that it’s Cloud and managed service portfolio makes Pi a one-stop shop for enterprises, for their entire IT infrastructure needs. Pi also offers very attractive cost models that are unique and one of its kind in the Indian market. Pi also offers its fully integrated private cloud environments, that can scale anywhere from 1 G to 100 G, in a quick time frame. Pi is a pioneer in building specialized and highly secured private clouds for enterprises. As a matter of fact, Pi is the first player (cloud service provider) in India, where we have built a mega end-to-end 100 G private cloud from network down to storage, that supports millions of transactions per second. Cloud4C pegged as the world’s 1st Tier-4 Cloud player is a ‘Made in India Cloud’ offering public cloud services built on a 4-Copy architecture providing ‘Zero Data Loss’ solution with inbuilt DR and backup. The company, which launched the public cloud in India way back in 2014, has established its footprint across 20 countries and 40 locations spanning USA, Europe, ANZ, Middle East, South East Asia and Indian Ocean region and powers over 2,500 enterprises on its public cloud and another 500 across private, hybrid and community cloud platforms through its robust IAAS infrastructure combined with managed services. It has also enabled 16 Indian and global banks on its Banking Community Cloud. Cloud4C powers SAP in India and worldwide through its SAP HEC (HANA Enterprise Cloud) through its SAP community cloud. While the company competes with major world players such as AWS, Microsoft, Google and IBM Softlayer, it also provides cloud managed services across all major public cloud platforms (AWS, Azure, Google, Cloud4C etc) through its dedicated centers of excellence (CoEs) manned by certified and skilled cloud architects, seasoned cloud experts. Its key customers include World Bank, leading Indian/Global banks, SAP, India’s leading enterprises like Tata Group, Jindal Group, Hindustan Lever, Nagarjuna Group, Sterlite Group, Shriram Group, Birla Group, Government of India etc. The company plans to be present in 40 countries and 80 plus locations by March 2019. On a High: A Look at Public Cloud Market Dynamics 0 out of 5 based on 0 ratings. 0 user reviews. Watch India vs Australia Live Online, Also Do You Know about the DRS Technology?